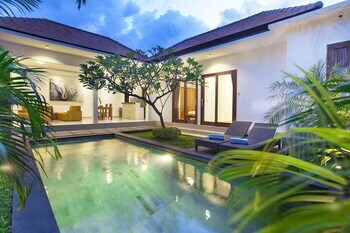 Located in Kerobokan, Kubu Manggala Villas Seminyak is on the Strip, within a 15-minute drive of Eat Street and Batu Belig Beach. Featured amenities include express check-in, express check-out, and dry cleaning/laundry services. A roundtrip airport shuttle is provided for a surcharge (available 24 hours), and self parking (subject to charges) is available onsite. When you stay at Pondok Wisata Adas in Ngadisari, you'll be 9 minutes by car from Putus Square. Free self parking is available onsite. With a stay at Airy Panakkukang Boulevard Ruko Ruby 51 Makassar in Makassar (Panakkukang), you'll be 8 minutes by foot from Mall Panakkukang.